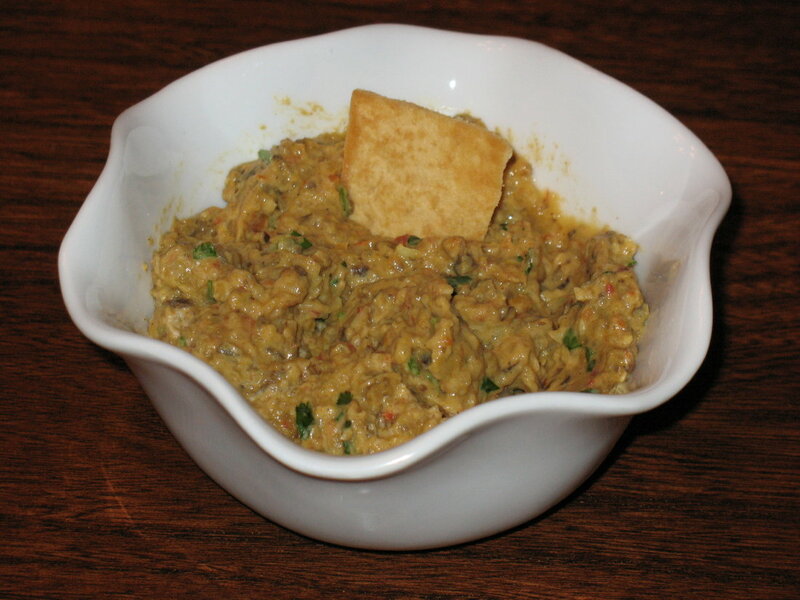 Today’s dip is a Curried Eggplant Dip. It’s loosely based on this recipe. I bet it’s delicious. But I’m lazy, and I didn’t have the ingredients. But my improvisation turned out pretty well. I’m not a fan of eggplant. Generally I think that it’s too boring and spongy-textured. In fact, I tried another eggplant recipe earlier this week, and the problem was that it was too clearly recognizable as eggplant. The closest I’ve come to enjoying eggplant thus far is baba ghanoush. I even once had a Baba Ghanoush Incident. That was back when I was pregnant with M. I was working as a museum educator and I was physically active all day (my boss was constantly telling me to slow down for fear that I’d bring on labor). After a long day of work, I’d ride the subway home for an hour and fifteen minutes. I would get hungry. Sometimes, I’d spend the entire ride without food, obsessing about what I would get to eat when I arrived home in Brooklyn. Like the time I obsessed about the leftover Chinese food in our fridge only to find that Cute W had thrown it out. Other times I’d grab a snack to eat on the ride. One day I chose baba ghanoush, and it turns out that roasted eggplant dip is not the most convenient snack, especially when you’re trying to read and eat simultaneously and you no longer have lap. It was everywhere. People were moving away from me. It was ugly. Not as bad as the later Fish and Chips Incident, but still, not pretty. But I’m getting off track. The point is, I don’t love eggplant. But it’s a purple! That’s my toughest dietary-rainbow challenge! I’m not even crazy about blueberries. But this dip is super tasty. I had it with pita chips and red pepper. The eggplanty flavor is not boring because it’s been roasted into yummy intensity. Better still, like baba ghanoush, the eggplant texture has been pulverized beyond recognition. Just the way I like it. Put roasted eggplant, chopped (raw) onion, tomato, and garlic cloves in a food processor and process until smooth. Heat olive oil in a pan over medium heat and add eggplant-onion-garlic mixture. Cook, stirring occasionally, about 8 minutes. Add sesame seeds and other spices (through cayenne), and cook 3-5 minutes more. If it starts to stick to the pan you can turn the heat down or add a little bit of water. Remove from heat and put mixture into a bowl. Stir in yogurt, cilantro, & lemon juice. This is good warm or cold. I think that you could also throw it over some rice warm. Theoretically it would be better after it chills for a while, but I wouldn’t know because I ate it. In fairness, I made a half recipe, because I wasn’t sure if I’d like it. But now I’m definitely making the second half. Because there’s nothing I’d rather do with those roasted eggplant cubes in the fridge. Cute W is away tonight, so thanks to a tip from Mary, I’m watching the super-fun Masterpiece Theater series Downton Abbey online. Because I am that woman. If you are a period-movie junkie, allow me to hook you up. In case you’re looking, the earlier dips were Lime-Spiked Black Bean Dip and Out West Bean Dip. There was also a post with salsa recipes. Looks yucky. But I bet it tastes good. I will give it a try!